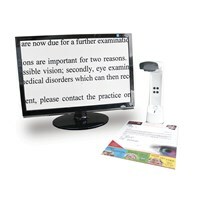 The PC-Eye is a versatile Compact Desktop Electronic Magnifier that allows you to instantly turn your PC or TV (not included) into an electronic magnifier by displaying magnified text on the screen. It's great for reading magazines, newspapers, mail, bills and greeting cards, as well as viewing photos. As an assistive tool for writing, you can use the PC-Eye portable electronic magnifier to fill out forms, write out holiday and birthday cards, write checks, balance your checkbook, and even to do crossword puzzles. Plus, it's compact enough to carry with you, and perfect for school, work, senior centers and trips. There are six levels of magnification from 4x to 12x - the larger the screen, the larger the image. The PC-Eye displays in full color for photographs and pictures, as well as greyscale, enhanced black on white and enhanced white on black to suit your preference for reading text. Built-in adjustable LED illumination helps bring greater clarity to material being viewed - it can even be used in total darkness. And the Freeze Frame feature lets you capture an image on-screen for closer viewing. The PC-Eye is a great alternative to other desktop electronic magnifiers that are more expensive and take up too much room. It's perfect for 'snowbirds' that split their time between homes, or anyone visiting with family and friends. No need to haul a heavier, bulkier desktop magnifier - just take the compact, lightweight PC-Eye with you wherever you go. All you need at your destination is a computer with an open USB port or a TV/monitor with a Video In jack. 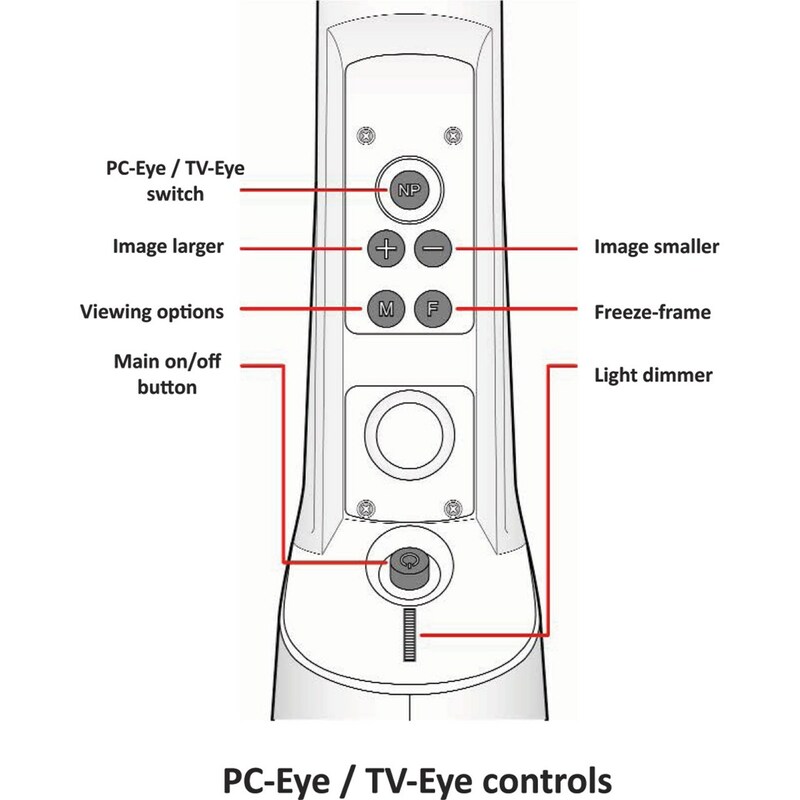 Easy to Set Up and Use: Simply plug the PC Eye into either the USB port on your computer or the Video In jack on your TV and put the PC Eye on top of its magnetic base plate. Slide the text to be viewed under the magnetic plate and it will be displayed on the PC/TV screen. 1. 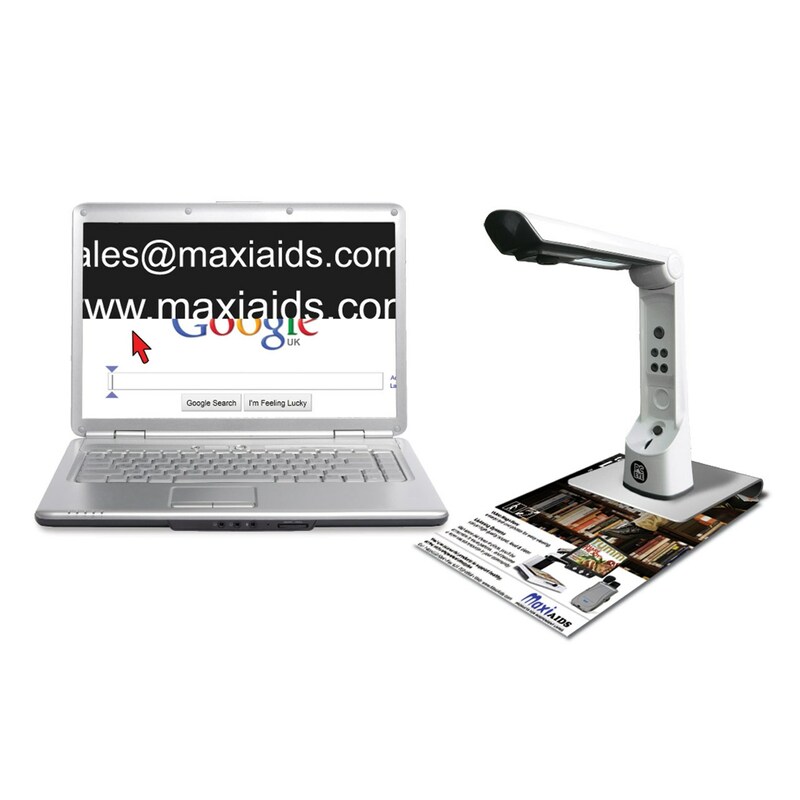 This product is a magnifier ONLY which requires a PC or TV screen/monitor (not included) in order to operate. 2. As the material being read must fit on the magnetic base, the TV-Eye is not suited for reading books or other material that is thick or which has larger dimensions. - Camera Measurements: 10.5 in. x 3.0 in. x 2.5 in. - Stand Measurements: 10.0 in. x 6.0 in. - Camera Weight: 22.6 oz. - Stand Weight: 32 oz.